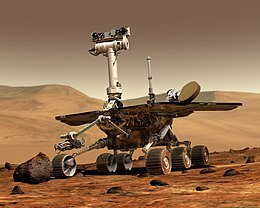 On February 13, 2019, the National Aeronautics and Space Administration (NASA) gave its Mars rover, Opportunity, a final farewell. Due to an extremely large and violent dust storm in June 2018, the rover’s solar panels were left covered and unable to power the robot. NASA, after not hearing from Opportunity for months, decided to declare the rover dead. This decision left the internet in a period of mourning. Opportunity is one of many rovers sent to explore the Earth’s red neighbor, Mars. It was launched into space in 2003 and landed on January 25, 2004. Opportunity’s mission was not only to explore the planet, but also to search for signs of past life. According to the Jet Propulsion Laboratory of the California Institute of Technology, “[s]ince landing on Mars in 2004, Opportunity has made a number of discoveries about the Red Planet including dramatic evidence that long ago at least one area of Mars stayed wet for an extended period and that conditions could have been suitable for sustaining microbial life.” This mission was meant to only last 90 Earth days, as that is how long NASA expected Opportunity’s battery to last, but the rover managed to continue on and gather data for 15 years. In June of 2018, a huge dust storm overtook the planet, much like one did back in 2007. NASA lost (what they thought would be temporary) contact with Opportunity when the rover missed it’s check-in call on June 12. NASA presumed it was because Opportunity had gone into low-battery mode due to the low sunlight levels, as it had done when it experienced its first dust storm. However, NASA began to worry when they did not hear back from the rover weeks after the storm had settled. After months and months of trying to contact their rover, on February 13, 2019, NASA decided to officially declare Opportunity dead. This declaration took the internet by storm after a heartfelt tweet given about the rover and a message of the rover’s last words. in the morning sun/ and when the night is new./ I’ll be looking at the moon,/ but I’ll be seeing you. Not only did NASA give the rover a parting gift, but Tanya Harrison, a Planetary Scientist and Director of Research at Arizona State University’s Space Technology and Science Initiative, made a Spotify playlist for the rover called “Wake Up! Oppy,” which consists of songs such as: Wake Me Up Before You Go-Go, Dust in the Wind, Here Comes the Sun, Miles Away, Running on Empty, and many others with heart wrenching titles. The biggest message that took the internet by storm was a tweet by science reporter, Jacob Margolis, that as he puts, is a “poetic translation” of Opportunity’s closing transmissions, which is “My battery is low and it’s getting dark.” This sad, but cute message had many people crying and longing for a rover they’d never met. Nicole Karlis of Salon wrote that much like with the death of a celebrity, “People have collectively turned to social media to mourn Opportunity by sending their condolences and thanking it for its service — in other words, grieving a robot.” While many people have joked about growing attached to non-living creatures, the number of people who mourned Opportunity show just how real that attachment is. While many mourned the loss of Opportunity, many also spent the time to congratulate the rover on its 15 year journey. NASA has been delighted with the information found on Mars, as well as been overjoyed that the rover managed to overcome its 90 day limit and continue on for many years after. Opportunity did a lot of work for NASA and much of its work will continue to be carried out Curiosity, another rover sent up to the red planet back in 2011. With the passing time, many hope that one day space travel will allow NASA to go up and rescue the beloved rover.